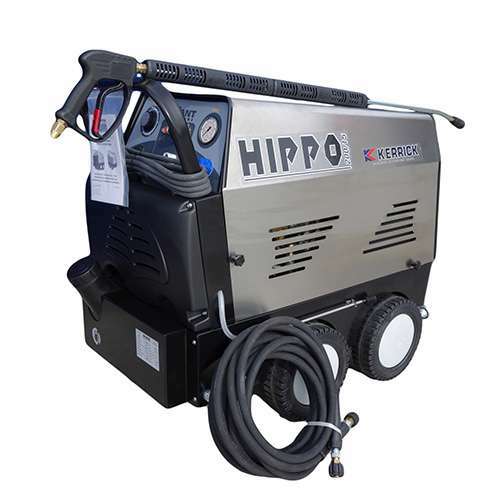 The Hippo is a mid-sized hot water pressure cleaner that heats water up to 100°C to quickly cut through dirt and grease. Better yet it can double as a cold water cleaner so you get great value for money and can tackle just about any job that comes your way. The Hippo has a powder coated steel frame and is designed to give easy access for maintenance. It also comes with four lifting eyelets, low fuel indication/cut-out, chemical metering valve and many more great features. The stainless steel cover gives long lasting protection to your investment and the low speed Interpump ceramic plunger pump offers much longer operational life than older style high speed machines.